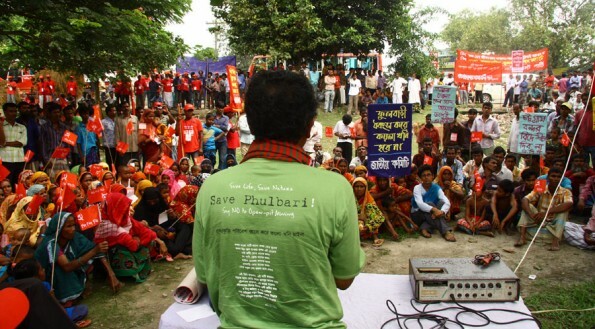 The week before the London AGM of GCM Resources was a tense week in Phulbari, where the company’s Bangladesh subsidiary Asia Energy wants to construct a huge opencast coal mine against local opposition. Leaders and activists of Phulbari Sammilito Peshajibi Sangathan and National Committee to Protect Oil, Gas, Minerals, Electricity and Port blockaded the Dhaka-Dinajpur highway, disrupting communications with the capital, and staged demonstrations at Phulbari upazila in the district protesting implementation of Phulbari Coal Mine Project. Gary Lye, of GCM Resources’ Asia Energy subsidiary in Bangladesh, left Phulbari with Police protection after protests. Locals declared an impromptu blockade programme as a top coal miner visited Phulbari in his bid to persuade residents in favour of an open pit mine on their farmlands.